Het koor laat jongeren zingen, met elkaar en ook met andere generaties en culturen. Concerten zijn op plaatsen waar muziek bijzonder is. In elke generatie is plek voor 10 leden. A choir that has young people sing, with each other and with other generations and cultures. Concerts are planned at places that need music. The choir performs in places like: in prisons, hospitals, homes for the elderly, and places in society where live music is seldom heard. 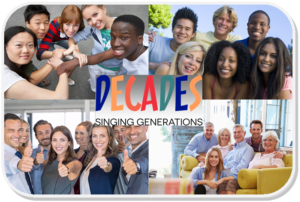 Decades is a choir for (international) students and people in their thirties, and fourties. In every age group there is place for 10 people. Conductor is Wieneke Groot. Students and people in their twenties sing for a reduced contribution ( 10 euro’s a month). International students sing for free. Rehearsals take place every Thursday evening. register here, or surf to the website of Decades where you will find a form to enter yourself.